“Public opinion in this country is everything,” stated President Abraham Lincoln in 1859. Fast-forward 154 years to the age of trending Twitter topics and 24-hour cable news. Public opinion seems to have a significant effect on social issues and in some cases, like the recent DOMA Act repeal, triggers changes in policy. However, its influence over science and technology policy is far less, where stakeholder opinion reins supreme. The general public is largely excluded, on the grounds that they are uninformed and therefore their opinions are not particularly useful for policymaking. This de facto policy of exclusion was recently demonstrated at the National Research Council Committee On Human Spaceflight’s meetings. The meetings on public and stakeholder opinions were closed to the public, with the exception of the first 30-minute, early morning session. I had the privilege of being one of two attendees representing the 300 million members of the public that heard Rebecca Keiser from the National Aeronautics and Space Administration (NASA) give a presentation on NASA’s public image. She highlighted NASA’s large Facebook following and its relatively high approval rating. She reviewed two studies, one by Harmonics International and one by ViaNovo, on public understanding and approval, and joked about the public’s ignorance of NASA’s aeronautics division. However, this sort of confusion offers evidence that the problem is not necessarily scientific illiteracy but also a failure on NASA’s part to establish a context for a program, to which the public can relate. While some might argue that large museums like the Smithsonian’s National Air and Space Museum and the Kennedy Space Center are an arena for science and the non-scientist to meet, engagement in the form of a dialogue is utterly missing. Without dialogue, there is still a chasm between the public and NASA’s programs. So while the museums display the history of NASA, it only draws those who are interested in its mission. The lack of a broader societal dialogue results in the general public having little opportunity to meaningfully articulate their values in shaping NASA’s future directions. 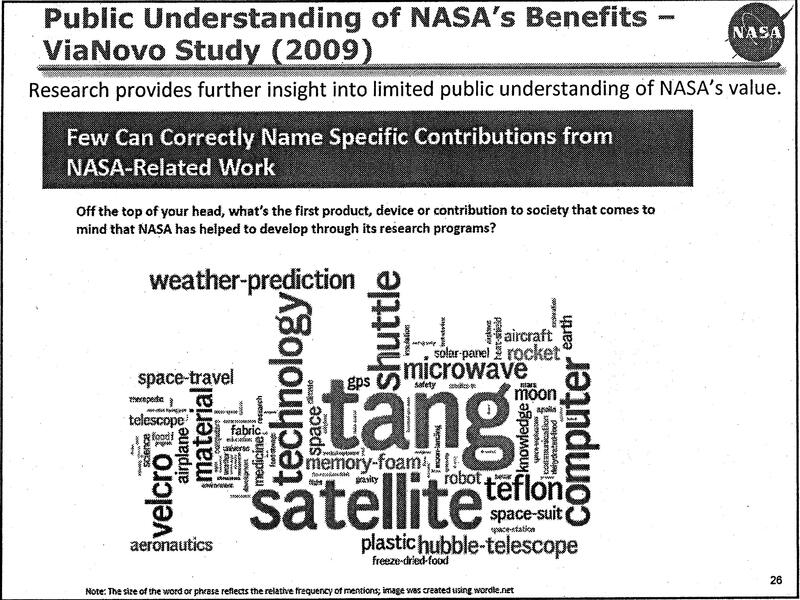 The committee on “Public and Stakeholder Opinions” have been charged “…to solicit broadly-based, but directed, public and stakeholder input to understand better the motivations, goals, and possible evolution of human spaceflight…and to characterize its value to the public and other stakeholders.” However, the committee, comprising of public policy and political science scholars, did not solicit any active dialogue with members of the public. Instead it is relying mostly on surveys and polls limited to discussing the public’s approval of NASA by way of old studies on public opinion along with a few questions mixed in by committee members. The only public input is coming in the form of an online “Call for Input” that asks that interested parties send in short papers with suggestions for the direction of the human spaceflight program. So far there are around 60 submissions and, as one might expect, most are from individuals associated with space programs and research institutes and universities, although there are a few “self” submissions. While there is nothing inherently wrong with this type of information gathering system, it does not do a great job of engaging the non-scientific community. Those who learned about the study and chose to respond are probably those who already have a solid understanding of the space program and are engaged in conversations about spaceflight. Since NASA is not reaching out to the average citizen, NASA will not have an accurate view of how the public values the program. It appears that NASA, like too many government organizations, has no plans to shape its future by engaging with the public. Only those who have existing knowledge and understanding of NASA’s programs are having any influence, while members of the public without space and aeronautics backgrounds are not seen as equal stakeholders in the future of the program. Others have also noticed the lack of public input. In her Space Policy article Amy Kaminski observed, “active presence of one set of stakeholders is notably missing from the landscape of space exploration policy deliberations: American Citizens.” She explains that politicians, scientists, and private corporations dominate NASA’s direction because of their professional and financial interest, but the taxpayers who fund these projects are generally left out as they do not take a stake in these discussions because they do not feel space exploration is relevant to their daily lives. Jose Aguto of the Friends Committee on National Legislation, in a recent conference on Climate Change and American Infrastructure strongly emphasized the importance of including the disengaged American citizens, or as he terms them—unusual suspects—in policy deliberations. He invited “all of us unusual suspects to raise our voices politically [to force change],” not just the outspoken advocates that are already very active. Engaging wide audiences is far from impossible. In September 2012, thousands of people around the world participated in the World Wide Views on Biodiversity event, including eighty-four citizens from around the Washington, DC metro area. These deliberations included citizens without high school degrees and some who were homeless. None of the participants currently fit the very narrow view of stakeholder; however they were able to discuss biodiversity, a topic many scientists have trouble defining. Once these people were brought together and given background on the topic, they were able to have meaningful discussions about their views on important issues being discussed around the world. Public engagement is the key to a meaningful future being that it is critical in helping governments decide on important program missions. The definition of stakeholder needs to broaden to include the average citizens and unusual suspects, not just scientists, politicians and those looking for financial gains. Engaging the public in dialogue and hearing their opinion is the only way to enrich debate and reflect the values of our democratic society. Public engagement requires that policymakers inform the public as necessary, without introducing bias, while soliciting input. The benefit to policymakers of this tricky balancing act is the ability to craft policy that represents the desires and opinions of an informed public. Perhaps more important to stakeholders, policy based on the values of the public is more likely to enjoy public support, which is an invaluable resource in the era of sequester. Engaging the unusual suspect will generate a diverse and creative dialogue that is invaluable when creating science and technology policy. Next Between Beijing and the Expert: Is Public Opinion Changing China?